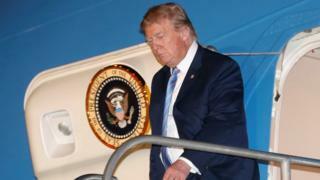 Donald Trump has the right to keep his tax returns private and Democrats' demands to see them are "harassment", a lawyer for the president has said. William Consovoy's statement hints at the shape of a possible future legal battle over the issue. On Thursday a Congressional tax committee demanded to see six years of Mr Trump's returns, saying it was necessary to ensure accountability. On Friday he said he believed that the law was "100% on my side". Mr Trump has maintained his business interests during his presidency, prompting questions about possible conflicts of interest. Questions also remain about his net worth, tax profile and past financial dealings. What did Trump's lawyer say? Mr Consovoy said the tax committee did not have a valid legislative reason to see Mr Trump's tax returns. "His request is a transparent effort by one political party to harass an official from the other party because they dislike his politics and speech," Mr Consovoy said of tax committee chairman Bill Neal.